This couple had a little bit of a challenging request. They wanted to exchange gifts and letters before their ceremony at Ursuline Academy, but they did not want to have a first look. 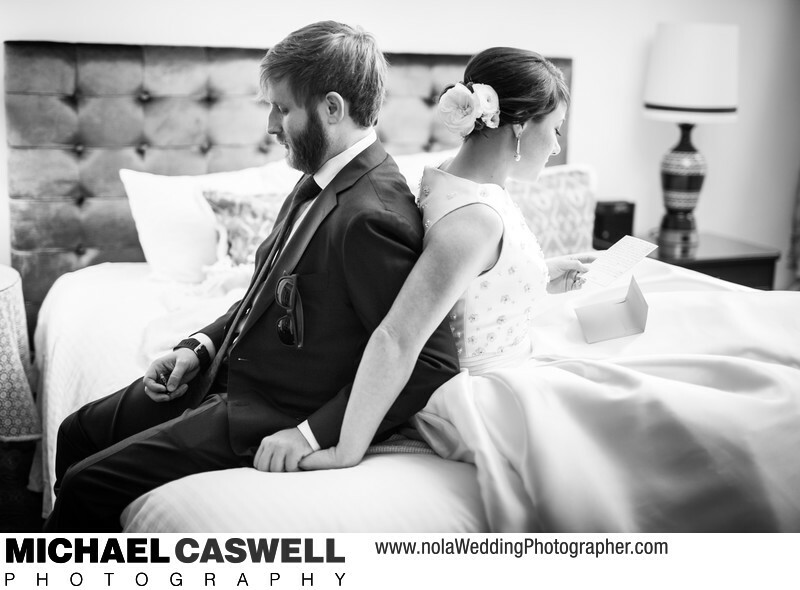 So, after scoping out the available space in the Pontchartrain Hotel where they were getting ready, I suggested that instead of trying to do this in a common area of the hotel like the lobby or lounge, simply sitting back to back on the corner of the bed in the bride's suite would be a more private and intimate setting for this moment. It took some careful coordination and maneuvering with CJ of Evermore Weddings to get the two of them in this position while ensuring they didn't inadvertently see each other, but it went off without a hitch! While a purely photojournalistic approach to wedding photography would arguably preclude me from influencing the stories that I am capturing, realistically speaking there are times during the wedding day when I have to help arrange a particular interaction or scene that the couple wants. The reception took place at Felicity Church. Location: 2031 St Charles Ave, New Orleans, LA 70130.